Here’s strange advice from an executive with a fast-food chain: Don’t pig out on our food. That’s in essences what Papa John’s founder John Schnatter said in an interview this week. There are those who are calling it a gaffe: “Blundering John Schnatter – the worldwide chief of Papa John’s – risked the wrath of shareholders when he said ‘just eat one or two slices’,” one British paper reported. Blunder or refreshing quasi honesty that consumers might appreciate? Depends on whether your emphasis is on selling as much of your product as possible or on sort of telling the truth. Schnatter’s claim is true as far as it goes. Eating two slices from a Papa John’s small original cheese pizza does indeed come in at below the Recommended Daily allowance for some of the bad stuff, even when you consider it’s only one of three meals a day. According to information on the company’s Web site, that serving size would weigh in at 160 calories, 3 grams of saturated fat – it doesn’t list total fat – 860 grams of sodium. The US Recommended Daily allowance is 20 grams for fat and 2,400 for sodium. So far, pretty good. The fat and calorie totals are less than the tally for a small McDonald’s hamburger and fries: 580 calories and 5 grams of saturated fat, though the pizza passes the sodium load of 680 grams for the burger and fries. Where Schnatter’s spin starts to fall apart, though, is when you look at the content in a larger pizza – the size a family is more likely to buy. 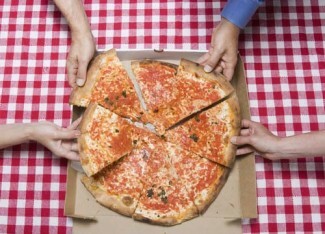 Two slices from a large cheese pizza: 600 calories, seven grams of saturated fat and 1,500 grams of sodium. Two slices from a large The Works pizza: 660 calories, 12 grams of saturated fat, 1,780 grams of sodium. Two slices from a large Hawaiian barbecue chicken pizza: 680 calories, seven grams of saturated fat, 1,900 grams of sodium. Even at that, he does better than some competitors. At Pizza Hut, two slices of large hand-tossed come to 640 calories, 14 grams of saturated fat, 1,640 grams of sodium. Dang. No wonder my rings never fit the day after dinner at Pizza Hut back before we started taking our own sauce. And let’s be honest: Who stops at two? Boots is about the only person I know who does. I usually eat two pieces of my own, plus the kids’ leftover crusts. Big Guy could easily eat half the pie by himself. So if Schnatter had said, “if you eat one or two slices, it’s not awful for you,” he would have been correct. Claiming it’s “very nutritious” is a stretch, though.